Any serious CrossFit athlete or fitness enthusiast should keep a pair of hand grips (aka gymnastic grips) in their gym bag. Why? Because hand grips promote consistent training and longevity of your hands. Without them, you risk getting blisters, ripping calluses, and missing workouts. Plus, the right pair of hand grips will allow you to stay on the bar or rings longer, which will increase your performance during workouts and make you stronger in the long run. The problem is that not all grips are made equally, and in many cases, they aren’t made well at all. Grips that are too bulky, don’t fit right, or make gripping a pull-up bar more difficult are more common than you think. In this article, we’ll review why you should train with hand grips, the benefits of hand grips for CrossFit, and what to look for when buying hand grips. Should you train with hand grips? Probably, but it depends on your goals. If you regularly perform gymnastic movements, such as pull-ups, bar muscle ups, ring muscle ups, or toes to bar, then you should own a pair of hand grips. You may even use them for barbell lifts if the bar has a thick knurling and you have a lot of repetitions to complete. Assuming you do CrossFit, this basically means your goals are in line with someone who needs good pair of hand grips. Just because you own a pair, doesn’t mean you have to wear them all the time. But having a good pair of hand grips could save you from missing a week of training. 1. Improve your grip. Is it your grip that’s first to fail on pull-ups or toes to bar? Is that failure actual muscular failure, or is it due to hand discomfort while on the bar? Hand grips help improve your grip by increasing the traction you have with the bar. So instead of coming off the bar at 8 because your hands are sore, you can really push it and crank out the last few reps. Your actual grip strength will improve over time, and you’ll perform better during WODs. 2. Save your hands. Second, and most important, is that hand grips keep you from missing training sessions. It may seem silly to think that a ripped callus can force you to miss workouts, but anyone that’s ever ripped one knows it’s a real thing. Think about how many fundamental CrossFit movements require you to grip something with your hands. If deadlifts, cleans, or anything to do with the pull-up bar or rings come up, you’ll be SOL until your ripped hand heals. Depending on your hand and what feels comfortable, you’ll be able to choose from a few kinds of hand grips. As they are smaller in size, hand grips with 2 fingers will feel less bulky on your hands and maybe more comfortable. If you have wider hands, 2 finger hand grips might expose your pinky finger callus. Especially if you use a wide grip on pull-ups, it may not be enough material to cover your hand. The benefit of 3 finger grips is having your whole hand covered. The downside is that there is more material covering the wider part of your hand, so it may not feel as comfortable when you hang from the bar. 3 finger grips will better protect you from calluses, but if your hands are smaller or the material you go with (see below) is too bulky, it might actually decrease your grip strength by making the pull-up bar thicker. The most important thing you must do is get an accurate measurement of your hand size so that you order the correct pair of hand grips. Most hand grips say to measure from the base of your palm to the base of your middle finger to figure out which size will fit your hand. Additionally, be sure to look at the finger hole sizing if you have smaller or larger fingers. Leather and neoprene hand grips are the most common materials you’ll find. Some grips, like Wodies and 321 Strong, hold patents on the technology they use on their material to ensure they either fit right or glide well when being used. Consider the thickness of the material you are purchasing. 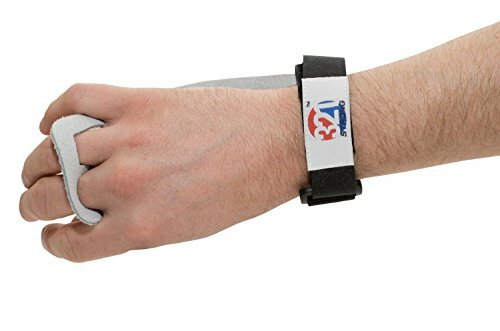 Ideally, your hand grips are as thin as possible while still providing support and protection from bar friction. Flexibility of your hand grips will determine how comfortable they feel. You want a pair that naturally moves with your hands, not something that prevents you from actually feeling the bar. The pair you choose should be flexible enough to move with your hand without you doing anything. If it folds over or doesn’t move with natural hand movements, find a different pair. Many hand grips come with a wrist strap that uses velcro or a buckle to hold them in place. Some wraps, like the Natural Grip (which were featured and funded on Shark Tank) come with no wrist strap. Instead, you use athletic tape to hold them in place before each use. If you CrossFit, you already know that cheap equipment will wear down quickly during workouts. Read reviews carefully, as many hand grips sell for cheap, but only last for a few workouts. You want a pair that are durable and will hold up to the rigors of various types of workouts. 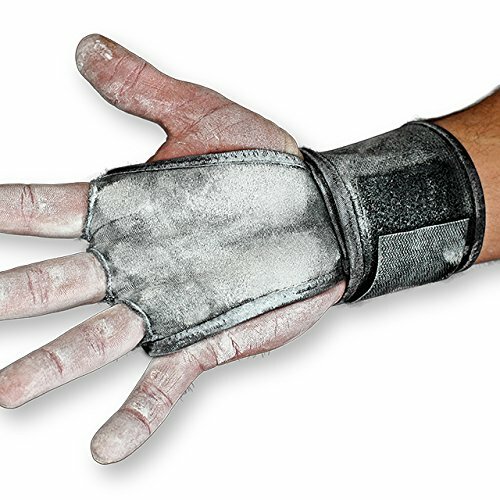 Bear Komplex make one of the most popular leather hand grip options for CrossFit athletes. Many athletes believe leather to be the best material, as it’s durable and doesn’t wear down after a few uses. Some reviews are mixed, saying the leather never actually breaks in. Regardless, they are durable enough to last a long time. These have a velcro wrist strap and 3 holes to ensure your whole hand is covered. Wodies hand grips come with 3 holes and a velcro wrist wrap too. They are much thinner than a typical leather hand grip, using patented material designed to absorb friction with absolutely no bunching or pinching of your hands during a workout. Reviews of these grips stand up. People think they are durable, fit better than leather, and work like they should. One unique benefit is that Wodies are machine washable. Unlike leather, this is one of the few pieces of gym equipment you can periodically clean. A much cheaper option than the other two listed, 321 strong makes a leather pair of hand grips that comes with 2 holes and a velcro wrist wrap. 321 Strong hand grips might be a good starter pair before you invest in something more expensive. Reviews of these grips say that they hold up, but sometimes bunch if you have bigger hands or don’t tighten the wrist wrap enough. The finger holes are also a little large for some sizes, so make sure to accurately measure if you go with these ones. 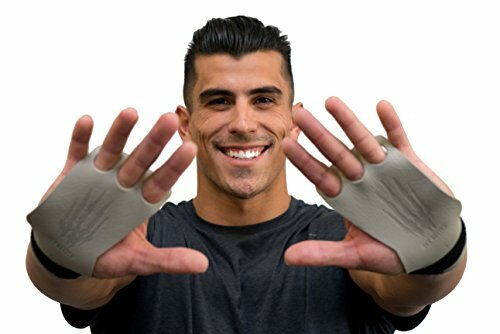 You want a pair of hand grips for CrossFit that are durable, prevent pinching on the bar or rings, and fit snug on your hands. The benefits of using hand grips are two-fold. You will save your hands from the perils of calluses and blisters, thus preventing you from missing workouts. You will also increase your grip strength, which will carry over to better performance during workouts and help you get stronger in the long run. While hand grips are small and even inexpensive, they are an important component of any serious CrossFit athletes gym bag. Even if you don’t use them for every workout, finding a good pair will keep you training longer and harder than you will be without them.